Today (June 2) is the Feast of the Ascension on the Christian calendar. It is one of those feasts that moves around depending on the date of Easter, and a late Easter this year means a late Ascension Day. It is a story that is very easy to make fun of, I think, as I have heard some critics of Christianity do. And in a way, I don’t blame them: Jesus floats upward and disappears into a cloud? Really? To approach the story in this way, however, robs it of the deep power that to me, at least, lies at its heart. The Ascension Day story is about a transition from one mode to another. From the time that Jesus called his disciples until his crucifixion, his followers enjoyed a personal, physical, human to human relationship with him. That seemed to have ended on the cross, but in the mystery of the resurrection, the disciples found that relationship renewed. With the ascension of Christ, however, the disciples must now move to a different kind of relationship with Christ, one that does not at all depend on physical presence or post-resurrection appearances. All that Jesus did and taught, all that he represented, the very meaning of his life — this is all in the hands of the disciples, along with the call to share it with the world. My favorite part of the story comes at the end: when the “two men in white robes” show up and say to the disciples, who are standing there looking up in the sky, “Hey, guys! Why are you standing there looking up?” This simple phrase must have redirected the disciples attention by getting them to look at each other and those around them. This simple thing makes a powerful statement: as followers of Jesus, don’t stand around staring up into heaven wondering where the heck Jesus is. Rather, look around you, at one another and at the family of humanity, and that is where you will find the Christ. To me, Ascension Day is about lifting the spirit of Jesus out of the particular incarnated life of a Jewish rabbi from Nazareth and making it available to all. 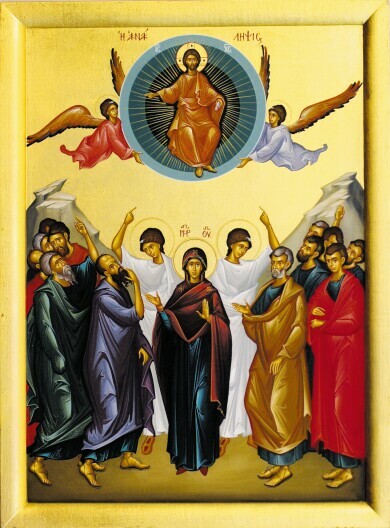 As such, Ascension is intimately linked to the Feast of Pentecost which comes 10 days later, when the disciples have a new experience that is the successor to the “Jesus experience”: and that is the experience of being embraced, engulfed by the Spirit of God. That experience is to be the sustaining experience, the one that will keep them always connected to the Jesus experience. It will also be the experience that inspires and motivates them to bring the good news of the Jesus experience to others. And so on Ascension Day, we remember that Jesus disappeared from sight. Yet, he is not gone. His spirit is abroad in us and in the world, calling us to and empowering us for the work and witness of his Gospel of compassionate, transforming love. Thank you, I really appreciate these thoughts on Ascension Day. I really like this passage and your reading of it. I’m not sure if this is an appropriate place for an open question, but you’ve previously described Communion as “spiritual therapy.” I realized that I’ve experienced Communion in exactly this way, but it would be nice to hear more at some point as to why this is so. How does Communion work? A few weeks ago the Gospel reading was the road to Emmaus passage, in which Jesus interprets Scripture to the 2 disciples, then they recognize him in the breaking of bread. I noticed for the first time that Luke could have said they recognized him in the interpreting of Scripture, but he doesn’t. Instead he’s made known to them in the breaking of bread. I wonder why Luke says it this way instead of the other way? At any appropriate time in the future it would be nice to hear more about this. Thanks for your insights, Casey. You raise a great question — I will look forward to responding to it and continuing the conversation further soon.